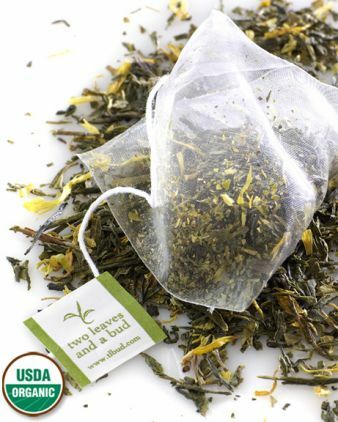 East meets West in this Japanese green tea blend! Sencha is the most consumed tea in Japan. It is long leafed tea, finished in the sun. Our Orange Sencha includes sunflowers, orange peel and just a hint of Italian red orange to add the slightest sweet & spicy tang to this classic green tea. The Japanese Sencha tea tastes fresh and crisp. The orange flavor is sweet and juicy. They come together in one cup to create a beverage that is light and rejuvenating. They are well-balanced with neither flavor overwhelming the other. I also note a very slight sharpness to the cup from the sunflower petals. It is just enough to help cut through some of the sweeter notes. The result is a tea that is sweet, tangy and enjoyable any time of the day. I think what I like best about this tea is that the flavors are delicate, natural tasting and in harmony with the high quality Sencha tea. It tastes like tea – it doesn’t taste syrupy or over-done with the flavoring. It doesn’t taste like one of those powdered soft drink mixes. It tastes like tea! I tried it first hot. It was smooth and delicious, and I was quite content to finish my cup the way I began. But then my husband came in and offered to take me out to lunch – how do I refuse that? My teacup was left on the kitchen counter to get cold. When I returned home several hours later, I found that the tea was just as delightful cold as it was hot – perhaps even more so! This would make a fabulous sun tea – just pop a few of the silky pyramid sachets into a jar of cold water and sit it on a sunny porch to steep. A few hours later you’ll have a jar of sunny, delicious goodness that will be a delight to kids as well as adults. A perfect summer-time treat!